The design world once again alights at Milan for the annual Salone Internazionale del Mobile or the Milan Furniture Fair as it's also known. To call it a grand affair would be somewhat of an understatement. Salone is the veritable design mecca, a high society event replete with the great and the good from all quarters of what is undoubtedly an eclectic design world. 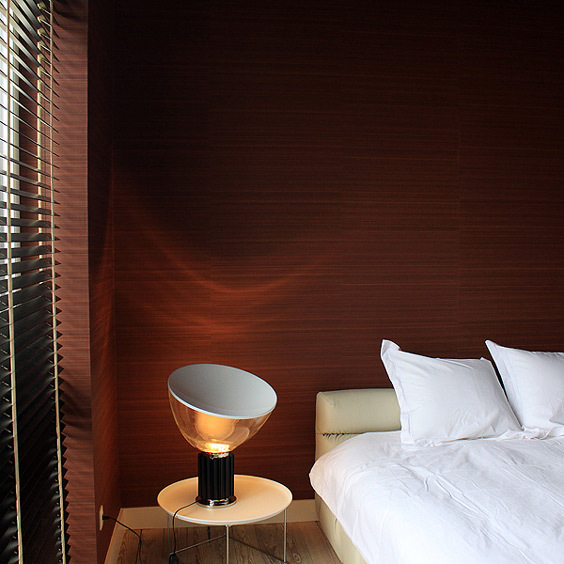 Taccia table/floor lamp. Image © Flos. The design classic by the ever-eminent Milan-based designers, Achille & Pier Giacomo Castiglioni. This year’s Salone theme is Milan, interiors of tomorrow. Design is ubiquitous, a bridge that links past, present and future. It is a powerful mediator between making something better or making it worse. As such, designers with a considered approach to design problems, those who think about design’s true potential and meaning, are necessary protagonists and leading lights in a densely populated field. Their vision can greatly enhance the lives of future generations, because they think not only about today, but also about tomorrow. &Tradition Mayor Sofa. Image via Nest. ‘Mayor’ was created in 1939 for Søllerød City Hall, Denmark, by Arne Jacobsen and Flemming Lassen. 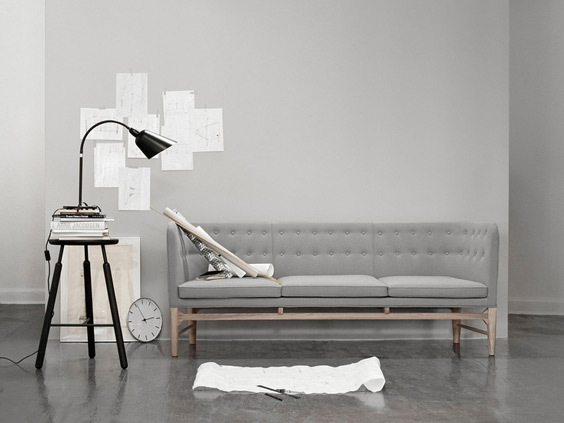 Its reissue by &Tradition won the award for ‘Best Reissue” at the Wallpaper* Design Awards, 2013. If we are to consider the interiors of tomorrow, then we must think about design as being virtuous or good. In advocating for design that is good, the acclaimed industrial designer, Dieter Rams, championed a number of good design principles. For example, good design should be innovative, aesthetic, unobtrusive, honest, long-lasting and as little design as possible. Perhaps within our current economic climate, people are thinking harder about what actually matters to them. In design this can equate to a rejuvenated appreciation for contemporary products, interiors and architecture that are designed with the highest levels of craftsmanship, exude quality and are enduringly modern. Moreover, many people want to have an emotional connection with design. With an eye on the future, they are firmly against ‘throwawayism’, choosing objects that are made with natural materials and built to last. Prouvé RAW Special Edition Fauteuil Direction. Image via Nest. 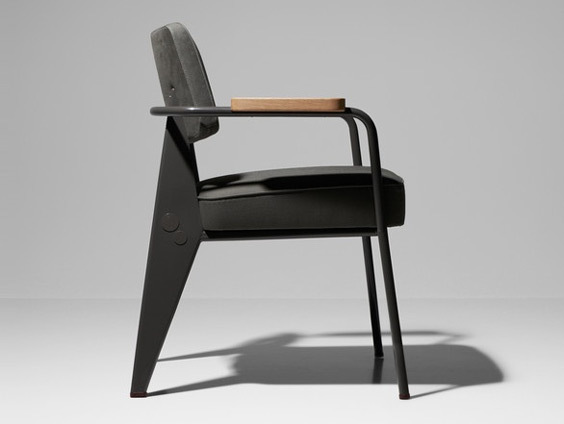 Vitra’s classic design by the innovative French designer Jean Prouvé has been reinterpreted in a modern version by G-Star RAW. A great number of companies and designers who embody the quintessence of good design are directly, or indirectly, working to bring about a change in societal attitudes to design. They are concerned with designs that are beautifully crafted, long lasting and timeless in their execution. This is true of companies such as Gubi, Vipp, Vitra, Republic of Fritz Hansen and Carl Hansen & Søn, to name but a few. Television and film have a role to play too. 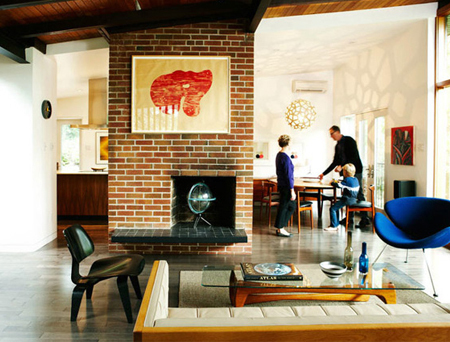 Many of us have fallen head over heels for that modernist tour de force that is Mad Men. It may be a time-capsule of 1960s Americana, but much of its style remains relevant today and will continue to be relevant far into the future. A Mad Men-esque setting. Image © Naomi Finlay. If Milan’s theme is interiors of tomorrow, then two interior spaces that people will find particularly pertinent in this regard are the home and the office. But what of their utility and function? It is fair to posit the idea that we have reached a tipping point in how we conduct our daily live-work balance. Where it may once have been a rarity to work at home, it is now becoming more and more common practice. This is especially true where we see a rise in the number of small businesses, freelance working and those magnanimous employers who are relaxing the strict protocol of employees being present in the office from Monday to Friday. 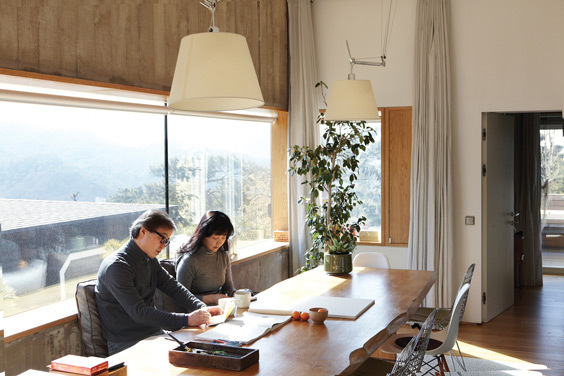 The question then arises - if the home is the new office, how do we structure this environment? And conversely, as our expectations of better working environs increase, how do we improve bland and often unwelcoming office surroundings? 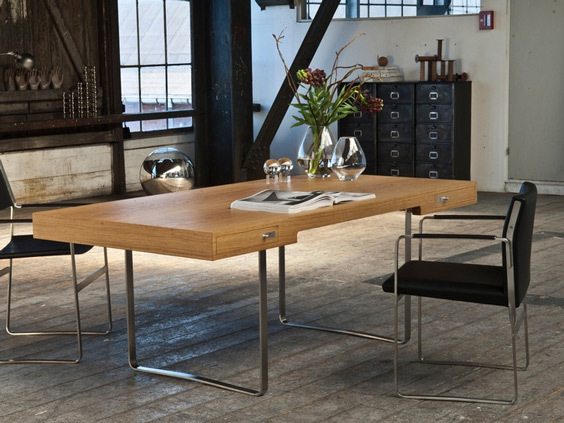 Carl Hansen CH110 Desk. Image via Nest. Designed by Hans J. Wegner. Ideally, design should be less autocratic than is often the case. For example, where offices are designed so that employees will work in a specific way or where homes are built so that people will live in a prescribed manner. Architects, planners and designers have the aptitude to think about people’s needs and their likely changes in behaviour as we progress further into the 21st century. As such, design is a powerful force for betterment. House in Seoul, South Korea. Photo © Jeremy Murch. Bridging the divide between the home and office, social working or shared working spaces are becoming more sought-after by entrepreneurs and freelancers. Eschewing the simple staid office plan, these environments are increasingly looking to design in order to add an innovative wow factor. Communal work spaces accommodate an array of working situations: from small desks for solo workers to larger tables for teams and informal meetings; lounge areas to interact, network and chat, and designated private meeting spaces. People are able to move around and typically no one has a fixed abode. Design furnishings and lighting add to the overall creative vision and help bolster expression, passion and professionalism. 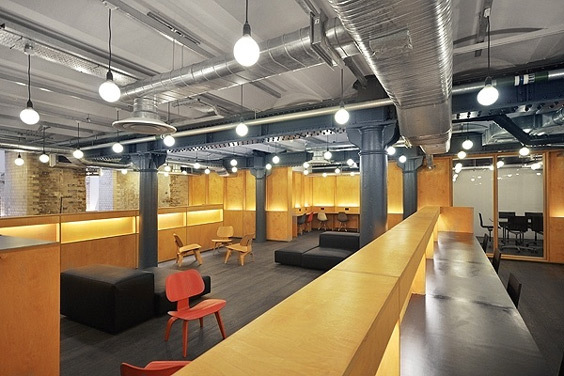 Club Workspace At Clerkenwell Workshops. Image © Workspace. When working from home, the delineation of an office space is important - or is it? Some of us may choose to have a desk in a dedicated room that is our study or office. Others may choose to set up shop at the dining room table, camping out until the kids come home from school or it’s time to cook dinner. And there are some who may grab their MacBook, curl up on the sofa and begin writing that article or report. Given the correct tools and enough design savvy, it is of course feasible that people are able to create a home working environment that suits their own particular manner. It is certainly something that many of us choose to consider when thinking about the work that we do. 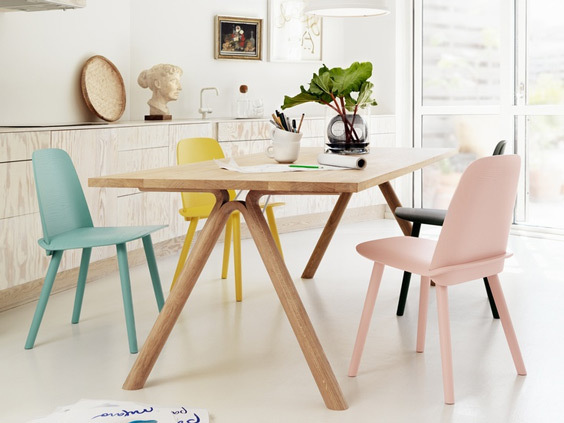 Muuto Split Table. Image via Nest. Milan’s insights and revelations about the interiors of tomorrow will doubtlessly effervesce during the festival, taking shape in both form and conversation, helping to define and influence the future state of design. But as already expressed, design is ubiquitous; its past is a link to its future. The interiors of tomorrow may not be so dramatically different to the good interiors of yesterday or today, but merely refined and improved upon versions. Gerard McGuickin is a freelance design writer and blogger for his creative design bureau, Walnut Grey Design.